Windows Server 2008 RDS CALs and App-V licensing: is App-V now free? Windows Server 2008 RDS CALs, required to access Remote Desktop Session Hosts running Windows Server 2008 R2, are the replacement for Terminal Server CALs used to access Terminal Server Sessions on previous Windows Server versions. Note: This article is also available as a downloadable PDF. Potentially missed in the flurry of announcements last fall was an announcement regarding Windows Server 2008 RDS CALs, required to access Remote Desktop Session Hosts running Windows Server 2008 R2, are the replacement for Terminal Server CALs used to access Terminal Server Sessions on previous Windows Server versions. The RDS CAL is also needed to use “Remote App” on a 2008 R2 Server. More importantly, the new RDS CAL includes the client access license for accessing App-V for Terminal Services on both Windows Server 2008 and Windows Server 2008 R2 Server! App-V, which goes by the formal name Microsoft Application Virtualization, solves application conflict issues by isolating applications. In the multi-user environment of Terminal Server/Remote Session Host, this solves the problem on installing an application and having it break another app by changing out a dll. It also allows many applications not written for multi-user (or multi-tenant), to run correctly in this environment. It allows multiple versions of the same app to be run simultaneously, and also allows applications that require administrator-like permissions to be run by a “normal user”. Note: There are two kinds of App-V licenses, one for the TS/RDS and one for Desktop operating systems like Windows XP, Windows Vista and Windows 7. This article does not deal with the App-V licensing for the desktop, which is included with the Microsoft Desktop Optimization Pack (MDOP). I find it easier to first make sure that we are clear about the licensing for the Server itself, plus the Terminal Server (TS) and new Remote Desktop Servers (RDS) CALs before bringing App-V into the picture. First, every server needs what Microsoft calls a Server CAL. This is basically your OS License, and the Server CAL you own must match the OS version. Access to these servers from external clients is licensed by the Client Access License (CAL). Just as there are different versions of the Server, there are different CAL licenses as well. There is a general policy regarding these CALs to keep in mind: newer CALs allow you to access backdated servers. Also, the 2008 TS CAL and 2008 R2 RDS CAL are functionally equivalent. In the drawing that follows, (ignoring the License Server complications for a moment), the client TS or RDS CAL allows access as indicated by green connection lines. Notice, of course, that this also implies that you older CAL does not normally convey the right to access a newer server (except that Server 2008 R2 accepts the 2008 TS CAL). You cannot “upgrade” you old TS CALs, these always require new purchases. Complicating this scenario is that TS and RDS licenses are validated by a License Server . Upon connection by a client, the TS/RDS server will contact a License Server to validate the license. Although a License Server may be installed on the server you are connecting to, it typically is on another machine. License Servers have a version for each of the OS versions (and need be installed on an OS of the same version). Generally, license servers can validate down-rev CALs, but not up-rev. Simply put, if you use a License Server of the greatest OS version in use, you are OK. There is a special case on back-rev CAL validation, however, introduced with the RDS CAL. By installing a special QFE to the Server 2008 License Server, it will accept the newer RDS CAL. This QFE is referenced in Microsoft Knowledge Base article 968074 . When Virtual Applications are to be run on a Windows Server 2003 Terminal Server, in addition to the Server CAL for the machine, and an accepted TS or RDS CAL, the user will need an App-V CAL. If the connection to the Terminal Server is using a Server 2003 TS CAL, an App-V TS CAL purchased from Microsoft for App-V 4.1 or 4.5 and above is needed. 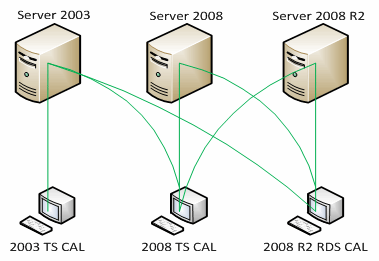 If the connection to the Terminal Server is using a Server 2008 TS CAL, this supplies the App-V CAL for this connection. If the connection to the Terminal Server is using a Server 2008 R2 RDS CAL, this supplies the App-V CAL for this connection. I should note that Microsoft no longer sells the App-V TS CAL. If additional licenses for App-V are required, purchase of the Server 2008 R2 RDS CAL will be needed. When Virtual Applications are to be run on a Windows Server 2008 Terminal Server, in addition to the Server CAL for the machine, and an accepted TS or RDS CAL, the user will need an App-V CAL. Notice that while the 2008 TS CAL, when originally purchased, did not include the App-V CAL, Microsoft has “grandfathered” this right to owners of the 2008 TS CAL. By implication, if you are using Server 2008 TS without App-V now, you may add App-V for Terminal Servers for free! Note that because Server 2008 R2 is only available as an x64 operating system, the only version of App-V that applies to this scenario is version 4.6 of App-V (which has not been released at the time this was written). Because licensing for App-V for TS is moving to being included with the 2008 R2 RDS CAL (and 2008 TS CAL), Microsoft has a trade-in program for the old App-V licenses you no longer need if you are on Server 2008 or above. This trade-in is a 4 for 1 deal, meaning that for every 4 qualified App-V for TS licenses you get one shiny new 200TS license must be 4.1 or 4.5 and was under a Software Assurance agreement as of September 1 2009. This program is supposed to be automatic and show up in Volume Licensing reports sometime in the first half of 2010. Note that if you still intend to the App-V licenses for Server 2003, you cannot do so and use the trade-in licenses. In that case, I would recommend contacting Microsoft to clarify your rights. In essence, Microsoft is making App-V for Terminal Servers free for companies using Server 2008 and above, when properly licensed for the TS/RDS CAL. This is a major “in-the-box” functional change that solves so many application issues with implementing TS/RDS to a large population of users. Disclaimer: Although I have passed this article by my contacts at Microsoft for accuracy review, as with anything licensing, this article cannot grant you rights and you need to depend on the rights as granted by your license. Outside the scope of this paper is yet another complication in that there is “per user” and “per device” TS/RDS CAL enforcement at the license server. Author: Tim Mangan is a Microsoft MVP for App-V and holds the position of Kahuna at TMurgent Technologies. He has spoken at every BriForum and other venues. Read more at his home blog or website. Even more reason not to use App-V itâs complete lock in and a carrot to upgrade to MDOP from desktops and then FU on Systems Center over time. All of that will give you a 60% enterprise solution and then you build or buy add-ons to increase cost even more. Thatâs the MS model, not innovation, good enough for the masses and screw the enterprise! RUN AWAY WHILE YOU CAN! You may need additional machines beyond those mentioned below in all scenarios.